The minister of Greenisland Presbyterian has described as “miraculous” an escape from a car that crashed and went on fire outside the Upper Road church on Sunday morning. Rev. David Cromie, who lives in the neighbouring manse, said that he was awakened by a loud bang when the vehicle struck a telegraph pole. “Initially, I thought somebody was stuck in the car. By the time I got to the car, they were out and gone,” he said. “The car was smoking at the time, then I could see a flame taking hold in the engine. Then the whole thing went up in flames. They could have been killed. The minister indicated that there was no damage to the building except a small crack in a window although there was some damage to the tarmac underneath the car. “An extra five feet and it would have been in the porch. The minister commented that the incident had the potential to have resulted in the loss of 20 lives as Upper Road is a route for dog walkers and early morning Sunday cyclists. He said that worship at the church was able to proceed as usual as the burnt out car and telegraph pole were removed ahead of the morning service. 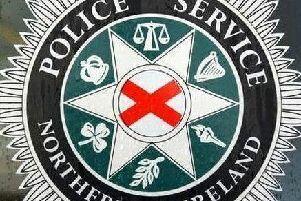 Meanwhile, a PSNI spokesperson said that police are investigating a report of a single vehicle road traffic collision at Upper Road, Greenisland, which occurred on Sunday morning at approximately 6.50 am. Two men, aged 20 and 22, were arrested a short time later. They have both been released on bail pending further enquiries. PSNI Sergeant Lowry said “We are working to establish the full circumstances surrounding this road traffic collision and the subsequent fire. “I am appealing to anyone who witnessed this incident to contact police at Larne on the non-emergency number 101, quoting reference 437 07/04/19. Northern Ireland Fire and Rescue Service stated that the alarm was raised at 6.49 am and a crew from Carrickfergus attended the scene to deal with a burning car which was brought under control at 7.13 am.